Last night T & I had a few things we had to get done… getting home at 6:00pm doesnt always give you all the time you need… to make supper, get your things done & get ready for bed. 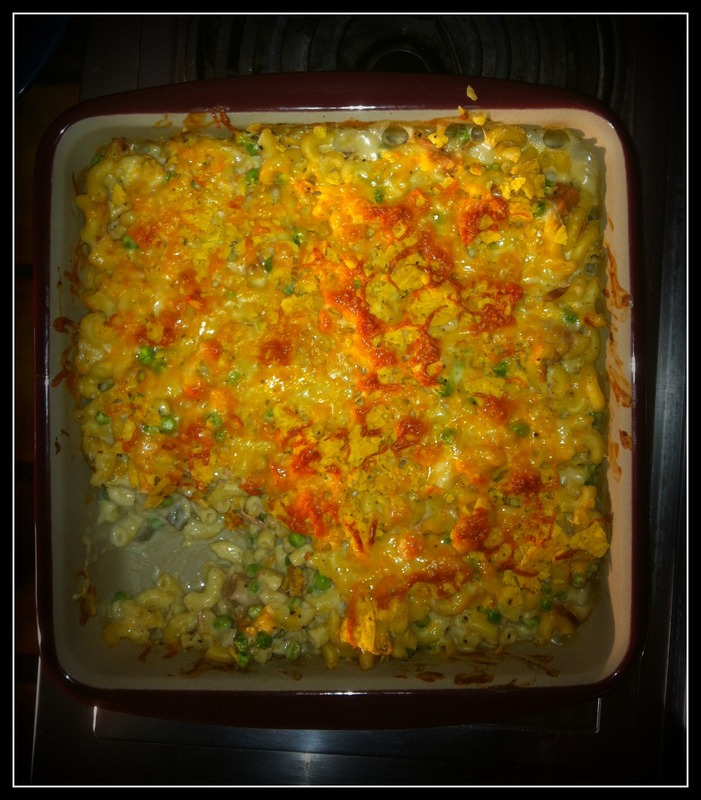 So I made a quick dish that always pleases at our house… Tuna Casserole!! I threw my own recipe together last night… Of course I didn’t measure anything so hope it turns out okay for you too! Preheat oven to 400F. Meanwhile cook pasta. Once pasta is ready, mix in all the ingredients above except the cheese & nacho chips. Once mixed, put in a baking dish. Sprinkle grated cheese & crushed nacho chips on top. Bake for 25 minutes. I usually keep an eye on mine after 20 minutes… but once the edges are bubbling you know its good to go! Then Serve. As you can tell it MUST be good seeing I already have a scoop taken out, before I realized DAMN I should have taken a photo. So Sorry… but we were hungry & it smelled so delicious! Give it a try.. its simple, fun, quick & different for those busy weekday nights!